It wasn’t so long ago that Ducks football was a national afterthought—a sometimes good but never great program, and one that once went 26 years without making it to a bowl game. But things are different now. Oregon has become one of the most successful programs in the country—competing for the national title twice in the past five years, while posting at least 11 wins per season. This eye-popping success on the field over the past decade follows another decade or so of slowly building the program. The Ducks have gained national notice for innovative game plans, successful marketing, impressive facilities, and their ability to attract players of a caliber that rarely came to the UO a generation ago. So what was the tipping point? 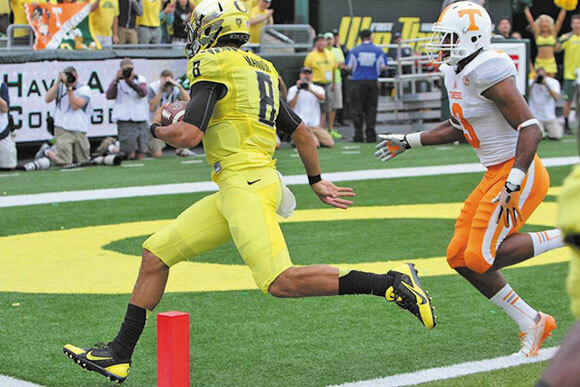 Was there a moment, a person, a game that caused the turnaround for Oregon football? When did the Ducks go from a regional also-ran to a program of national prominence? We put these questions to some Ducks fans, who offered many theories—and much for fans to argue about until next season. Oregon, led by Bill Musgrave, BA ’90, beat the University of Tulsa 27–24 on a frigid day in Shreveport, Louisiana. That Independence Bowl was their first trip to postseason play since 1963. 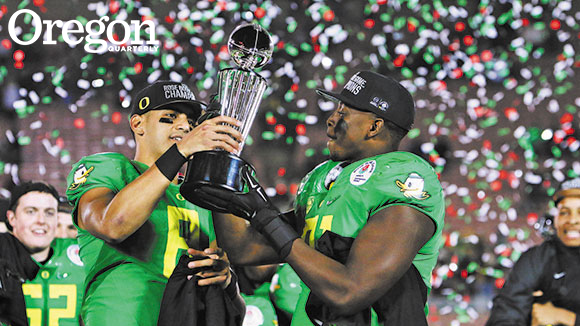 It’s worth remembering that in the 24 years since, the Ducks have played in 19 bowls. While fans may disagree on whether the most praise should be heaped upon Rich Brooks, Mike Bellotti, Chip Kelly, or Mark Helfrich (right), all agree that effective, innovative coaches and continuity in the program have contributed to the Ducks’ success. That continuity extends, of course, to assistant coaches. 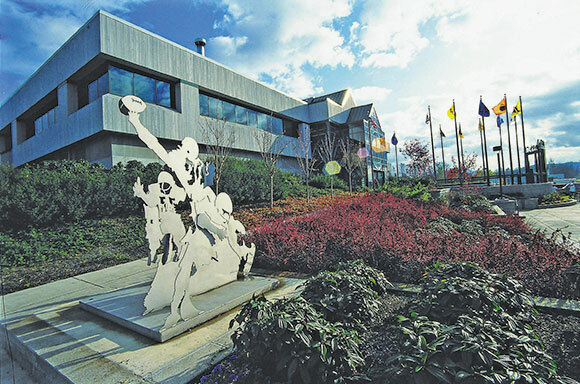 Oregon has earned national attention for its football facilities, most recently the Hatfield-Dowlin Complex, which raised the bar for collegiate football operations centers when it opened in 2013. But the university has been investing in innovative facilities much longer than that. Many people point to a pivotal meeting that reportedly took place between then coach Mike Bellotti and benefactor Phil Knight, BBA ’59, in the late 1990s. Though this conversation occurred in private, the gist of the chat has been widely discussed, including in an article this fall in USA Today. editor for other papers in Southern California. The Ducks have become as famous for the variety of their wardrobe as for the tempo of their offense. 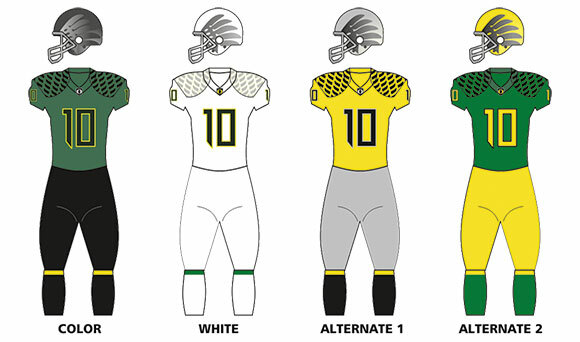 Drawing on the expertise of designers at Nike, the Ducks enjoy a seemingly endless variety of uniform variations. Many current and recent players say that the ever-changing helmets and jerseys were among the things that first attracted them to the program. Obviously, all successful college football teams are built on strong recruiting. This season, the Ducks continued to win even as several key players were out with injuries—a common downfall for weaker teams. For Oregon, though, a deep bench with multiple players with similar skills is fundamental. In 2001, the university erected a giant billboard in Times Square promoting quarterback Joey Harrington’s Heisman bid. Harrington did not win the trophy, but the billboard brought unprecedented media attention to the University of Oregon. En route to a trip to the Rose Bowl, the Ducks beat the University of Southern California in a nationally televised game in 2009. Until then, the Trojans had remained the dominant team in the Pac-12 conference. The schools that everyone considers national powerhouses—such as Ohio State and Florida State, Oregon’s opponents in this year’s inaugural College Football Playoffs—tend to produce Heisman Trophy winners regularly. Buckeyes have won the Heisman seven times and Seminoles have won three times. 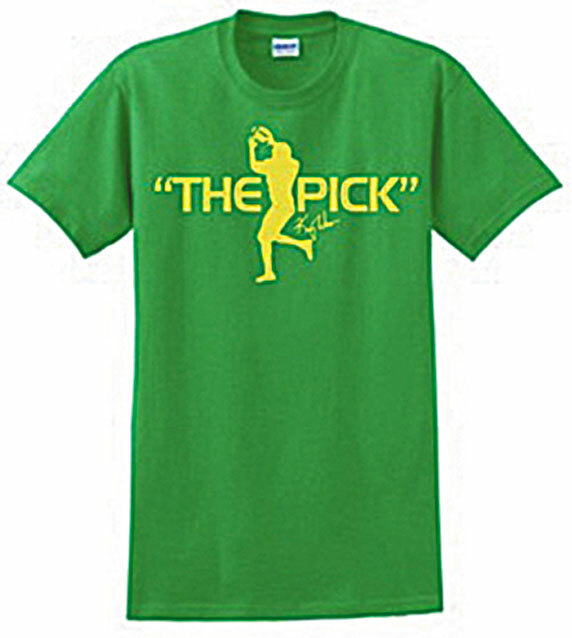 Until Marcus Mariota, no Duck had ever won the award.